Every once in a while, a new restaurant comes along that totally raises the bar, and becomes the place to be seen at, but for all the right reasons. 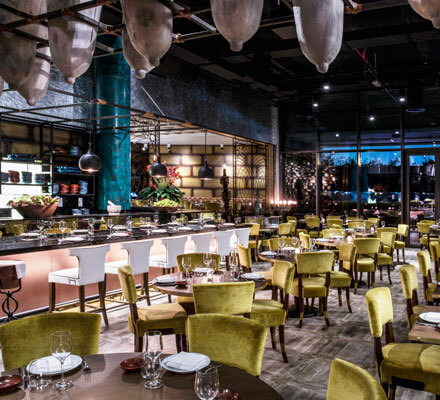 Coya, the new Latin American restaurant at the equally new Four Seasons restaurant village complex, is one of those. The space at this London-imported concept, in typical Dubai style, is big, but filled with life, thanks both to its carefully thought-through décor — think Incan memorabilia, ceramic Pisco vats hanging from the exposed ceilings, and Mayan textiles, combined with subtly glamorous marble and metal — as well as its buzzing atmosphere (even on weeknights). For starters, we opted to try the classic ceviche, Yukon gold potatoes topped with crab (I loved this so much, I hung on to a piece in case I wanted to have some at the end! ), and chicken skewers spiced through with amarillo peppers. We were also urged to try the specialty beef heart skewer — it’s got a strong flavour but, well masked with the pepper sauces, tastes quite appetising. My choice of main course was the strongly recommended spicy beef fillet with crispy shallots and garlic, while my partner opted for the Josper-grilled corn fed baby chicken with aji panca peppers. With sides of Peruvian asparagus drizzled over with tomato dressing, and the day’s special patatas bravas (crispy fried potatoes, topped with spicy sauces — my standout dish of the day! ), we found everything to be cooked to perfection, and packed with flavour, thanks to the authentic spices used. For dessert, I tried a sorbet/granita version of classic Peruvian purple corn cocktail Chicha Morada, which was light and refreshing, while fighting with my chocoholic partner over his chocolate concoction with roasted white chocolate ice cream as well, which we both loved. Coya achieves that rare something that good food is really meant to —become an emotional experience. With our friendly Peruvian waitress doing a brilliant job of recommending, explaining and serving, the restaurant comes out on top on all counts — ambience, food and service. If you want to go: Around Dhs700 for two, without drinks. Call 04-3169600.